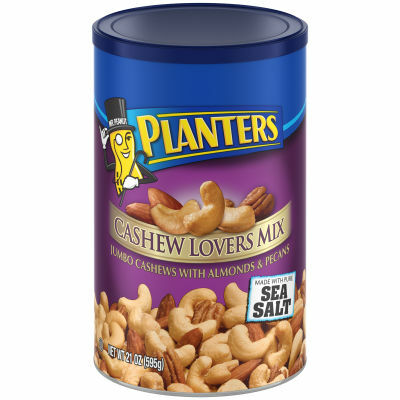 Planters Cashew Lovers Mix - Calling all cashew lovers! If you're a fan of this smooth and tasty nut but prefer to have a variety of other snacks to crunch on at the same time, this is the mix for you. Planters combines jumbo cashews with almonds and pecans, seasoned to perfection with pure sea salt, bringing you the best snack combination you could ask for. The Perfect Mix of Crunch to Munch - Planters uses only its premium quality nuts to prepare this perfect mix of jumbo cashews, almonds and pecans, packed with flavor and nutrient . Add this nut mix to your salads or grab a handful to snack on alone. The 21 oz. can contains no cholesterol. Serving size 1oz (28g/about 22 pieces).